From my perspective, psychology is the most interesting subject in the world. Whatever your chosen field of study (or possible majors if you are undeclared), understanding key components of psychology will aid in your success as a student, coworker, significant other, and/or parent. Over the course of a semester, my students are provided a broad overview of psychology from a biopsychosocial perspective. There is some information about my teaching style that one should understand. First of all, I do not typically lecture on the material you will be reading in your primary text. Your book is well-written and covers the traditional areas of general psychology very effectively. Instead, my lectures cover supplemental material to help you to synthesize the text material and understand on a deeper level how psychology relates to life. Secondly, I have the reputation of being a good, but challenging instructor. The "challenging" label some students attribute to me is based upon my exam format. Now before you panic, please allow me to explain. My students are never confused as to what will be covered on an essay exam, as I tell my students exactly what to study. The "challenging" part is that my essay exams tend to be somewhat lengthy and detailed. If you have experience taking essay exams, then my tests will likely not pose too much of a challenge for you. However, if you have little or no experience writing essays, please be sure to carefully follow my study suggestions. I am also always available to discuss any areas of confusion my students may have. Your tests are designed to build skills incrementally. For the on campus classes, the first test is mostly multiple-choice and a few fill-in/ short answer only; the second exam is multiple-choice, a couple of short answer, and one cued-recall essay (a type of fill-in, pre-written essay), and the third test has a few fill-in/ short answer questions and an essay section. Students in my classes are also invited to write essays ahead of time, so that I can go over them (allowing you to study confidently "A" level essay notes). Note: Due to the accelerated term, tests for the online summer & winter sessions are almost exclusively multiple-choice with a few fill-in/ short answer items ONLY. The final exam, which is not comprehensive, is in an objective format only (multiple-choice) for all terms. Thirdly, I approach my Psych 1 course in a somewhat non-traditional manner, in that I often lecture from a non-dominant perspective. What I mean by that is that I attempt to show students how different, less often heard perspectives can change the way one views a given situation. For example, when teaching about the pharmacology of (and the potential value of) anti-depressants and other medications, I also teach about the somewhat controversial perspective of Dr. Peter Breggin, M.D. (and others) who are critical of medication use in many circumstances. I do not expect my students to adopt a given perspective about which I teach. Rather, my purpose is to help students to be exposed to different worldviews, since a wise person understands many different perspectives. This is, in many ways, the primary function of higher education: exposure to different perspectives. What I hope to do with this description is to give you as accurate a view of the course as possible. If this course sounds exciting to you, then I believe we will have a stimulating, fun, and informative semester. The success of my students when they transfer, whether to a university setting or the workplace, is extremely important to me, so I work hard to try to help my students to develop their critical thinking, writing, and study skills. I remember vividly how the workload and expectations increased dramatically when I transferred from the community college to the university setting. I had only one instructor, my former mentor Don Johnson, whose testing format served to make me a success at Santa Clara University. My other community college instructors' course content was very helpful to me, but it was Don's exam format that prepared me for university. The structure of my courses is based upon Don Johnson's testing format for that reason. I want my students to be well prepared. Some of the community service I have engaged in over the years includes working with elderly ESL clients, four severely autistic adults, and clients at a battered women's shelter, tutoring pregnant teens in a GED preparation course, and helping to build houses with Habitat for Humanity. In the past, I have been a member of many committees in the district, a few of which include the academic senate, several hiring committees (both full and part-time), the minority advocacy committee (the chair briefly and a member for years), the accreditation committee, and serving as a Puente mentor. I have also served on the West Valley powwow committee (from 1999-2012), and I was the co-chair for seven years. Please attend the West Valley College Annual Powwow. 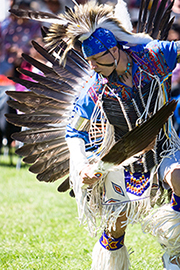 Enjoy a fun-filled day of singing, drumming, and dancing while broadening your understanding of Native American individuals, tribes, and nations. All cultures and ages are welcome! Admission and parking are free. Watching movies (mostly foreign & independent films): My favorite directors are Krzysztof Kieslowski, Ingmar Bergman, Akira Kurosawa, Zhang Yimou, and the Coen Brothers (director & producer team). Listening to music and attending concerts with friends & family: I like many types of music, ranging from classical and opera to rock and jazz. I also enjoy hiking with my dogs, pilates, gardening, drawing (charcoal and pen & ink), painting (acrylic & watercolor), traveling (favorite location: Australia), and reading (especially psychopharmacology, social psych, & ab psych). Favorite singer/ songwriter: Peter Gabriel (especially So, Us, & Up). Tehya --13.3 pounds of romping, stomping Rat Terrier. "Beanie" is an adorable, extremely hyper little animal with excellent hunting skills. I only wish she could use some of her energy to help me grade bluebooks! Diego --my strong-willed, intelligent, tri-colored Queensland Heeler. Diego loves to give "heeler hugs," in which he often pushes over, while kissing wildly, the hapless recipient seated next to him.